This was the year of "Smudge, Splash & Pop" - every week, the lovely Kristin came up with a delicious combination of two colours plus just a dash of a third and we could use these colours to create any kind of project that took our fancy. Firstly, I was inspired to invent a new art form - Snail Art!! If you would like to see how I gave six snails a mixed media makeover, click here. As well as encouraging you to try different colour combinations, Summer of Color is a great opportunity to experiment with different media and techniques, so I thought I would make a journal page for each week and then put them all together to make a little book, using my new toy - the Bind It All. On the six rings of the binding, I tied scraps of ribbon in the colours we were given to play with for each of the six weeks of SOC4. Inside back cover - watch this space! So, that's it for another year - but you can still share your work and check out all the amazing art inspired by SOC4 over at Twinkle Twinkle and on the FB group. 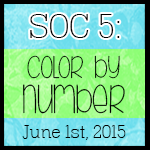 And Kristin already has me intrigued about next year's SOC5 - can't wait! Annie how AWESOME is this?! I love it - so creative! The SOC thing you participated in sounds super cool. Definitely inspired! Wow! Gobs-mackingly WOW! LOOOVE how you've used those colours & the whole journal looks tremendous....you certainly got a lot outta this years course:):) My fave is the one with the verse in the wavy lines on it - the blue one....if I'm allowed a fave!! !